Tourmaline Jewellery Or Precious Stone Jewellery? Tourmaline is an unusual semi precious gemstone as it is available in all colours. For this reason and that it offers up beautiful flawless stones, tourmalines have been used as substitutes for precious gems - rubies and emeralds in particular. Being a semi-precious gemstone tourmaline is less expensive than the precious trio. It also occurs in paraiba form - an ombre of different colours in the same crystal formation. Paraiba tourmaline is mined in Brazil. The name tourmaline is derived from the Singhalese word turmali meaning mixed. 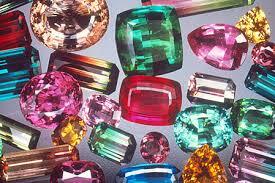 To learn more about tourmaline read About Gemstones. If your lover, partner, wife, sister, mother or daughter was born this month then a piece of tourmaline jewellery is an ideal and personal gift. If you're over the 7 year itch and heading towards your 8th anniversary, a tourmaline bracelet or tourmaline pendant might be just what you're looking for.